Opened on 6th May 2014, the Shangri-La is the tallest hotel in Western Europe and the first high-rise hotel in London. It's also the first UK hotel from Shangri-La, Asia Pacific's leading luxury hotel group. Best for a room with a view. The first ever luxury Shangri-La Hotel in London is also the tallest in Western Europe. The first ever luxury Shangri-La Hotel in London will have the unique selling point of occupying the upper floors of one of the tallest buildings in Europe when it opens on 6th May 2014. Standing at 310 metres (1,016 feet) tall the Shard tower, also known as London Bridge Tower, stands 245 feet higher than One Canada Square in Canary Wharf - previously London's tallest tower. 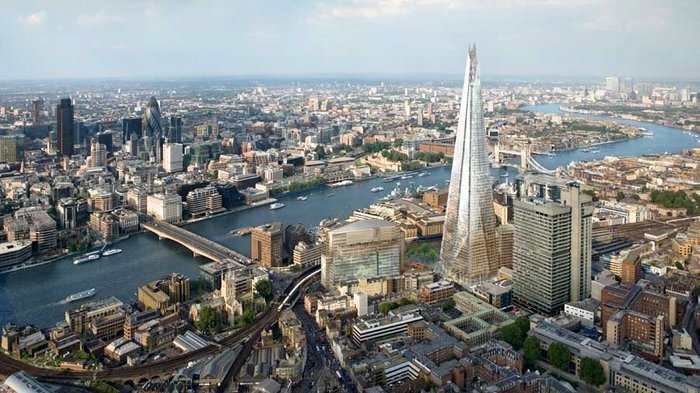 Taking up 18 floors of the Shard - from floor 34 to 52 - the Shangri-La will offer 195 rooms, 170 deluxe guestrooms, averaging more than 42 square meters each making them among the largest in London. Its 25 suites, including two specialty suites and a presidential suite, are sure to be something special - with glass-enclosed 'wintergarden' balconies. Guests can sink into the 'Shangri-La Bed', with its patented body-contouring technology, and enjoy state of the art luxuries like LCD televisions, hi-fi equipment and business services. Choose a classically English experience or an Asian-inspired alternative. Two afternoon tea options - a classically English experience and an Asian-inspired alternative - are on offer at the Shangri-La's 35th-floor restaurant, Ting, both complemented by an exclusive selection of over 30 teas. With the restaurant overseen by Emil Minev as executive chef, previously of the Ritz in London and Shangri-La's Tokyo and Maldives properties, the modern European menu has an Asian touch. The English Afternoon Tea features classic and chamomile scones served with Cornish clotted cream and strawberry jam, as well as pastries such as cappuccino cake and sandwiches filled with smoked salmon and crème fraiche. While the Asian Inspired Afternoon Tea sees dishes such as Chines-style egg custard tart and steamed prawn dumplings served alongside the scones. At high tea finger food, sweet and savoury treats will be served while the sprawling city below presents a feast for the eyes. Modern European food with a hint of Asian flavouring is on the menu at Ting. Modern European food with a hint of Asian flavouring is on the menu at Ting, the signature restaurant and lounge of the Shangri-La, the five star hotel occupying the middle floors of Renzo Piano's 72-storey Shard. From the hotel's sky lobby on level 34 it's a short but spectacular walk up the sweeping staircase to the restaurant on level 35 which gets its name from the Chinese word for 'living room'. Signature dishes include hand-dived scallops from the north-west Highland coast cooked a la plancha and served with carrot, ginger and a light yuzu and grape seed oil dressing and organic Welsh lamb from Rhug Estate, glazed with mirin, sake and soy sauce, served with root vegetables and Kentish apples. The more casual lounge has an a la carte menu of Asian specialties including curry laksa, 'Hainan' chicken rice and char koay teow. Afternoon tea is also something of a speciality with two options on offer - a classically English experience, and an Asian-inspired alternative - both with 30 teas to choose from. One of three restaurants and bars within the Shangri-La, Ting is two floors beneath the hotel's bar, Gong, while artisan deli Lang can be found on the ground floor. London's highest bar, on the 52nd floor of The Shard. On level 52 of The Shard, Gong is London's highest bar and the Shangri-La Hotel's crowning feature. Henning Neufeld, previously of Shangri-La Beijing, will be head mixologist at the destination bar which takes its name from 'dougong', an ancient Chinese structural element of interlocking wooden brackets that will be a component of the bar's interior, a look put together by Hong Kong designer Andre Fu. One of three wining and dining options within the Shangri-La, Gong is two floors above Ting, the hotel's signature restaurant and lounge on level 35, linked to the hotel's reception area on level 34 by a spectacular grand staircase sweeping across double length floor-to-ceiling windows. Added to these is Lang, an artisan deli on the ground floor which gets its name from the Chinese word for 'pathway'. Gong on level 52 is on the same floor as a 24-hour gym and London's highest infinity pool. The hotel's 11-metre indoor infinity pool can be used for poolside cocktails at night. The hotel's 11-metre indoor infinity Skypool on level 52, open 6am to 8pm, offers panoramic views of the London skyline. On the same floor as the hotel's 24-hour gym, also open to residents of the apartments directly above, the pool is overshadowed by an oversized 'paint scroll' which appears to float overhead as swimmers do their lengths while looking west across the City, taking in views of St Paul's Cathedral, the London Eye and Westminster during the day before functioning as an extension of the bar space at night. From cheap budget places to stay to luxury 5 star hotels see our discounts for hotels, including Cafe Royal Hotel from 56% off.